The “I Choose Support" mentoring movement is a faith and community based mentoring program which involves community volunteers providing support and guidance to returning citizens. Individuals who have successfully completed supervision under the criminal justice system can also choose to support in this effort. The goal of mentoring is broadly focused on addressing offender needs for pro-social relationships, assisting them in developing solutions to basic living skill problems, and engaging them in the community. The transition from prison to the community or the expectation from case managers can cause returning citizens to be overwhelmed by issues such as employment, transportation, and housing. Given that case managers are commonly viewed as authority figures, coaches may be more effective at providing informal and emotional support than formal interventions. It is important for returning citizens to know that the community is invested in their success which is what community coaches assure. Each pilot site consists of eligible dedicated coaches providing mentoring to willing participants prior to release and continuing upon their return to the community. Coaches have the flexibility to mentor participants in a variety of means, locations, etc. The essential role of a coach is to be a supporter. It will take time for some participants to open up and feel comfortable in discussions during mentoring meetings and other interactions with their coaches. Coaches are responsible for working with eligible returning citizens in a variety of possible forms to provide support and act as a positive role model in the returning citizens’ lives. Coaches have to work thoughtfully to build the relationship and develop trust that is sustained over time. Coaches should be familiar with the Community Supervision Officer (CSO), also called “case managers”, of their mentees and be willing to serve as mandatory reporters when necessary. They are to document every contact with the returning citizens in a manner that can be accessed by the CSO and everyone involved with the returning citizen’s case. 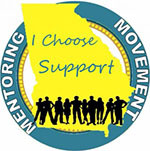 In-reach participants with a Next Generation Assessment (NGA) score of 5 or more in any area are prioritized for the “I Choose Support” mentoring movement. Additionally, a Reentry Counselor may recommend mentorship as deemed necessary as a result of their assessment and on-going communication. In-Reach cases requesting mentorship are given priority. Participants are screened as closely as coaches for this program in that there should be an interest in a successful transition into society and receptiveness to assistance. Participation in the movement is voluntary on the part of the returning citizen. If you are interested in volunteering as a mentor. please click the link below.